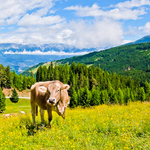 21/07/2013This entry was posted in Austria, Europe and Middle East, Tirol, Travel News and tagged Ischgl Food Guide on 21st July 2013 by Andy Mossack. Mountain hikers are in for delicious dishes when they stop for lunch along the historic pilgrims’ path of Jakobsweg in the Paznaun-Ischgl region of the Austrian Tirol. 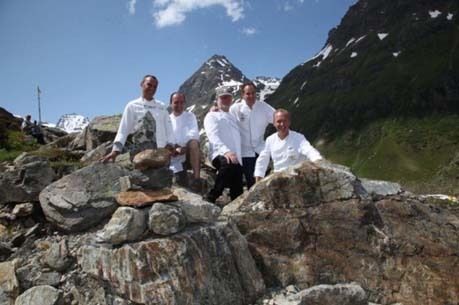 Top chefs from around Europe have developed tasty dishes using local produce, which are delighting hikers who stop at the four main mountain lodges above the villages of Ischgl, Galtür, Kappl and See in the Silvretta Mountains of The Alps. This is the 5th year of the Culinary Jakobsweg which brings excellent cuisine and rugged hiking together and runs all summer long. This summer, chefs Otto Koch from Germany; Kristof Coppens from Belgium; Rik Jansma from The Netherlands; and Gian Paolo Raschi from Italy are the guest chefs, each creating a dish for a particular lodge and then instructing the lodge staff on the recipe. The mouthwatering dishes are ravioli with porcini and ricotta in parmesan fondue; Paznaun lamb with potato and garlic pureé and broad beans; venison goulash with mushroom soufflé; and pork belly with onions, goats’ cheese, tomato and crispy mustard seed. You can see more on the chefs, lodges and recipes on www.ischgl.com/en/enjoy/summer-highlights/culinary-st-jacobs-way, which also has a tempting half board gourmet package from Euro 159 pp available to include 3 nights’ accommodation in one of the four villages, one night in one of the mountain lodges and the Silvretta Card All Inclusive. The card offers a great range of free services, plus discounts on others eg equipment hire. FREE are activities in the Kids Club programme; guided themed walks; all cablecars and chairlifts; swimming pools in Ischgl and Galtür; the sports and water park in See; local road tolls and buses; entry to the Alpinarium in Galtür and the museum in Ischgl.